Our most popular Family Crest Plaque. This plaque is made from thick solid oak and comes with a beveled edge. You will not be disapointed with this plaque. 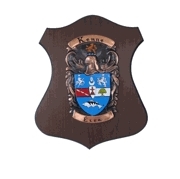 Browse below for the best quality & selection of Coat of Arms Plaques on the web. We will not be beaten on price or quality for our Coat of Arms Plaques. Many of our plaques are hand painted by heraldic artists. Most of our crest plaques are either made from wood or pressed wood product. Check back often, as we are always adding new plaques to our selection. Welcome to our Family Crest Plaques Blog. We have over 1 million family crests available. We can custom make a wood shield plaque for you.